"Down in a Shell crater, We Fought Like Kilkenny Cats"
The Battle of Cambrai (20 November-7 December 1917) was a British campaign of the First World War. Cambrai, in the Nord d�partement (Nord-Pas-de-Calais), was a key supply point for the German Siegfried Stellung (part of the Hindenburg Line) and the nearby Bourlon Ridge would be an excellent gain from which to threaten the rear of the German line to the north. The operation was to include an experimental artillery action. Major General Henry Hugh Tudor, commander of the 9th Infantry Division, suggested trying out new artillery-infantry techniques on his sector of the front. During preparations, J. F. C. Fuller, a staff officer with the Royal Tank Corps (RTC), was in the process of looking for a place to use tanks as raiding parties. General Julian Byng, commander of the British Third Army, decided to incorporate them into the attack. The battle is often erroneously noted for being the first large-scale use of tanks in a combined arms operation. However, the French had deployed large numbers of their own tanks in April (130+), May (48), and October (92) 1917, and the British more than 200 at Ypres in June and July of the same year. Despite the initial success of the Mark IV tanks at Cambrai, German artillery and infantry defences exposed the frailties of their armour and the vehicles became mostly ineffective after the first day. The battle was largely an artillery-infantry engagement that achieved offensive surprise and technical superiority against strong fortifications but weak German infantry and artillery defences which were quickly reinforced. The British attack demonstrated that the Hindenburg Line could be penetrated and showed the value of new artillery and infantry methods, such as sound ranging and infiltration tactics that would later play a vital part during the Hundred Days Offensive. The popular perception of the battle as a tank battle was largely the result of extensive writings of biased historians Basil Liddell Hart and J. F. C. Fuller, of whom the latter erroneously claimed credit for the operational plan. Liddell Hart, a critic of Douglas Haig, attempted to use the battle to indicate a "new" form of doctrine. Liddell Hart's position as Military Correspondent of the Daily Telegraph and The Times newspapers, 1925-1939, allowed him enormous access to the public and therefore great influence. Several modern studies and the British Official History, rejected their version of events. The British plans originated from Henry Hugh Tudor, commander of the 9th Infantry Division artillery. In August 1917, as Brigadier-General, he conceived the idea of a surprise attack in IV Corps sector that his unit occupied. Tudor suggested a primarily artillery-infantry attack, which would be supported by a small number of tanks to secure a breakthrough of the German Hindenburg Line. The German defences were formidable; Cambrai having been a quiet stretch of front thus far enabled the Germans to fortify their lines in depth and the British were aware of this. Tudor's plan sought to test new methods in combined arms, with emphasis on artillery and infantry techniques and see how effective they were against strong German fortifications. Tudor advocated the use of the new sound ranging and 'silent registration' of guns in order to achieve instant suppression fire and surprise. Tudor also sought to use tanks to clear extensive barbed wire defences, whilst supporting the tank force with the No. 106 shell fuze, designed to explode high explosive (HE) ammunition without cratering the ground to supplement the armour. The battle began at dawn, approximately 06:00 on 20 November, with a carefully prepared and predicted but unregistered barrage by 1,003 guns on German defences, followed by smoke and a creeping barrage at 300 yd (270 m) ahead to cover the first advances. Despite efforts to preserve secrecy, the Germans had received sufficient intelligence to be on moderate alert: an attack on Havrincourt was anticipated, as was the use of tanks. The attacking force was six infantry divisions of the III Corps (under Lieutenant General Pulteney) on the right and IV Corps (under Lieutenant General Woollcombe) on the left, supported by nine battalions of the Tank Corps with about 437 tanks. In reserve was one infantry division in IV Corps and the three divisions of the Cavalry Corps (under Lieutenant General Kavanagh). Initially, there was considerable success in most areas and it seemed as if a great victory was within reach; the Hindenburg Line had been penetrated with advances of up to 5 mi (8.0 km). On the right, the 12th (Eastern) Division advanced as far as Lateau Wood before being ordered to dig in. The 20th (Light) Division forced a way through La Vacquerie and then advanced to capture a bridge across the St Quentin canal at Masnix�res. The bridge collapsed under the weight of crossing tanks, halting the hopes for an advance there. In the centre the 6th Division captured Rib�court and Marcoing but when the cavalry passed through late, they were dealt a sharp blow and fell back from Noyelles. On IV Corps' front, the 51st (Highland) Division stalled at Flesquix�res, its first objective and this left the attacking divisions on each flank exposed to enfilade fire. The commander of the 51st Division, George Montague Harper had substituted his own tank drill for the standard one laid down by the Tank Corps; that and excessive distance between the tanks and the infantry contributed to the failure. Flesquix�res was also one of the strongest points in the German line and was flanked by other strong points. Its defenders under Major Krebs also acquitted themselves well against the tanks, almost forty being knocked out by the Flesquix�res artillery. Some accounts claimed five were knocked out by a lone artillery officer, Theodor Krx�ger Batterie Feld Artillerie Regiment 108. Field Marshall Haig's dispatch praised the gunner's bravery in his diary. There is little evidence for Krx�ger's actions, although it possible that he may have been responsible for as many as nine tanks. Of the 28 tanks lost in the action, it was through a mixture of German artillery and breakdowns. It is possible Haig was encouraging this account to cover for the failure of combined arms cooperation with the infantry, as he had ordered the assault with no infantry support. In future, he correctly concluded that skirmishing infantry was needed to bring the artillery crews under small-arms fire to allow the tanks to operate. The common explanation of the "mythical" German officer ignored the fact that the British tanks were faced with the German 54th Division, one of the few divisions with specialised training in anti-tank tactics and with experience against French tanks in the Nivelle Offensive. Despite this the Germans were forced to abandon Flesquix�res during the night. To the west of Flesquix�res, the 62nd (2nd West Riding) Division swept all the way through Havrincourt and Graincourt to within reach of the woods on Bourlon Ridge and on the British left, the 36th (Ulster) Division reached the Bapaume-Cambrai road. Of the tanks, 180 were out of action after the first day, although only 65 had been destroyed. Of the other casualties, 71 had suffered mechanical failure and 43 had ditched. The British lost around 4,000 casualties and took 4,200 prisoners, a casualty rate half that of Third Ypres (Passchendaele) and a greater advance in six hours than in three months there. The British had failed to reach Bourlon Ridge. The German command was quick to send up reinforcements overnight and was relieved that the British did not manage fully to exploit their early gains. When the battle was renewed on the 21st, the pace of British advance was greatly slowed. Flesquix�res, which had already been abandoned and then Cantaing were captured in the very early morning but in general the British took to consolidating their gains rather than expanding. The efforts of III Corps were officially halted and attention was turned to IV Corps. The effort was aimed at Bourlon Ridge. Fighting was fierce around Bourlon and at Anneux (just before the woods) was costly. German counter-attacks squeezed the British out of Moeuvres on the 21st and Fontaine on the 22nd. Even when Anneux was taken, the 62nd Division found themselves unable to enter Bourlon Woods. The British were left exposed in a salient. Haig still wanted Bourlon Ridge and the exhausted 62nd Division was replaced by the 40th Division under John Ponsonby on the 23rd. Supported by almost a hundred tanks and 430 guns, the 40th attacked into the woods of Bourlon Ridge on the morning of the 23rd. They made little progress. The Germans had put two divisions of Gruppe Arras on the ridge with another two in reserve and Gruppe Caudry was reinforced. The British 40th Division reached the crest of the ridge but were held there and suffered over 4,000 casualties for their efforts in three days. More British troops were pushed in to move beyond the woods but the British reserves were rapidly depleted and more German reinforcements were arriving. The final British effort was on the 27th by the 62nd Division aided by thirty tanks. Early success was soon reversed by a German counterattack. The British now held a salient roughly 11 km (6.8 mi) by 9.5 km (5.9 mi) with its front along the crest of the ridge. On the 28th, the offensive was stopped and the British troops were ordered to lay wire and dig in. The Germans were quick to concentrate their artillery on the new British positions. On the 28th, over 16,000 rounds were fired into the wood. Picture - The German Counter-Attack. As the British took the ridge, the Germans began reinforcing the area. As early as the 23rd, the German command felt that a British breakthrough would not occur and began to consider a counter-offensive. 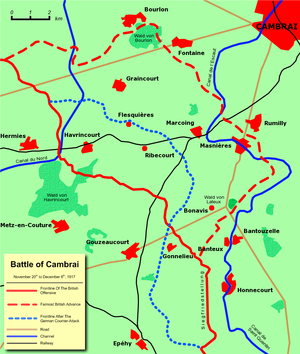 Twenty divisions were arrayed in the Cambrai area. The Germans intended to retake the Bourlon salient and also to attack around Havrincourt while diversionary attacks would hold IV Corps; it was hoped to at least reach the old positions on the Hindenburg Line. The Germans intended to employ the new tactics of a short, intense period of shelling followed by a rapid assault using Hutier infiltration tactics, leading elements attacking in groups rather than waves and bypassing strong opposition. For the initial assault at Bourlon three divisions of Gruppe Arras under Otto von Moser were assigned. On the eastern flank of the British salient, Gruppe Caudry attacked from Bantouzelle to Rumilly and aimed for Marcoing. Gruppe Busogny advanced from Banteux. These two corps groups had seven infantry divisions. Lieutenant General Thomas D'Oyly Snow, commander of the British VII Corps to the south of the threatened area, warned III Corps of German preparations. The German attack began at 07:00 on 30 November; almost immediately, the majority of III Corps divisions were heavily engaged. The German infantry's advance was unexpectedly swift. The commanders of 29th and 12th divisions were almost captured, with Brigadier-General Vincent having to fight his way out of his headquarters and then grab men from retreating units to try to halt the Germans. In the south, the German advance spread across 8 mi (13 km) and came within a few miles of the vital village of Metz and its link to Bourlon. At Bourlon, the men under Moser met with stiffer resistance. The British had assigned eight divisions' worth of fire support to the ridge and the Germans suffered heavy casualties. Despite this, the Germans closed and there was fierce fighting. British units displayed reckless determination; one group of eight British machine guns fired over 70,000 rounds in their efforts to stem the German advance. The concentration of British effort to hold the ridge was impressive but allowed the German advance elsewhere greater opportunity. Only counter-attacks by the Guards Division, the arrival of British tanks and the fall of night allowed the line to be held. By the following day, the impetus of the German advance was lost but pressure on 3 December led to the German capture of La Vacquerie and a British withdrawal east of the St Quentin canal. The Germans had reached a line looping from the ridge at Quentin to near Marcoing. Their capture of Bonvais ridge made the British hold on Bourlon precarious. Picture - Marwitz (right) and the Kaiser on the way to visit troops near Cambrai in December 1917. 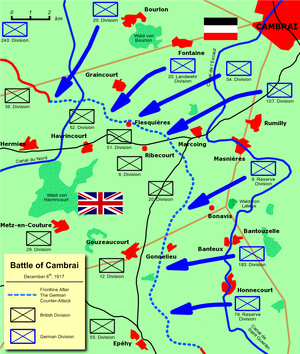 On 3 December, Haig ordered a retreat from the salient and by 7 December the British gains were abandoned except for a portion of the Hindenburg line around Havrincourt, Rib�court and Flesquix�res. The Germans had exchanged this territorial loss for land to the south of Welsh ridge. Casualties were around 45,000 for each side, with 11,000 Germans and 9,000 British taken prisoner. In terms of territory, the Germans recovered most of their early losses and gained a little elsewhere, albeit with a net loss of ground. The battle showed the British that even the strongest trench defences could be overcome by a surprise artillery-infantry attack using the newly available methods and equipment, with a mass tank attack as a bonus; it also showed the Germans the effectiveness of their similar new Stormtrooper tactics so recently invented by General Hutier against the Russians. These lessons were later successfully implemented by both sides. Picture - Frontlines before and after the battle. Hammond, Bryn (2009). 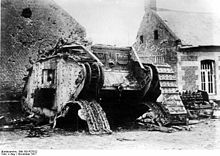 Cambrai 1917: The Myth of the First Great Tank Battle. Orion Publishing. ISBN 978-0-7538-2605-8.